I had been looking forward to do another recipe with Quinoa for some time. 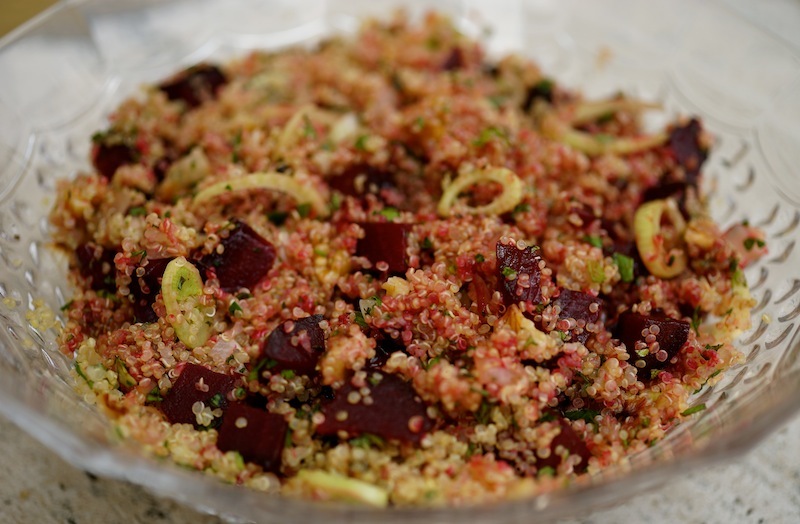 This Quinoa Salad with Roasted Beetroot is a great dish. 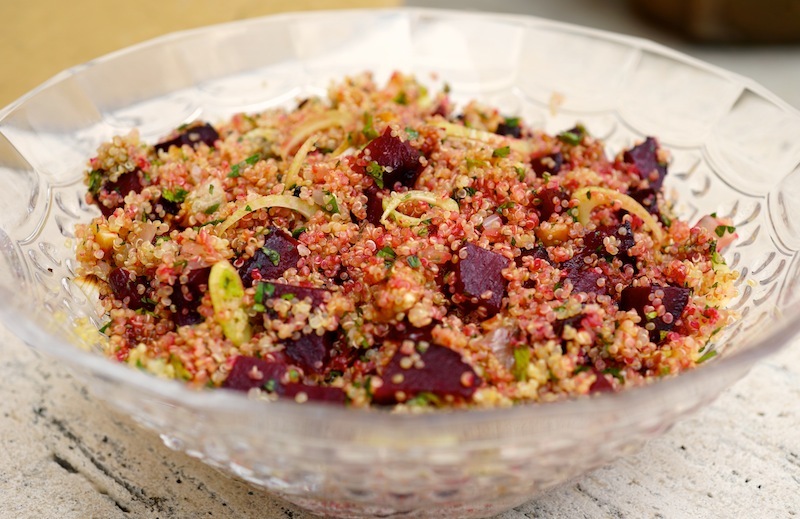 The quinoa and the roasted beetroot are the star ingredients but the dried cranberries, the toasted walnuts along with the wonderful herb mixture make this salad incredibly tasty and so healthy. I also love the vinaigrette, the honey emphasizes the sweetness of the beetroot as well as its natural earthy flavor. The balsamic vinegar makes the flavours pop out even more. It was adapted from a recipe by the Mexican Chef Oropeza. Beetroots: Preheat the oven to 200ºC/400ºF. Place the beetrrots whole and the halved onion in a baking tray. Pour over the olive oil and add the thyme. Bake for 30 minutes or until the beetroot and onion are well roasted. Due to the high altitude here, it took me 50 minutes. Remove from the oven and let it cool down. Peel the beetroots and cut it in cubes or in thin slices if you prefer. Thinly slice the onion. Set aside. Vinaigrette sauce: Mix all the ingredients in a glass jar with a lid and shake until well combined. Salad: Mix all the ingredients in a bowl, add the roasted beetroot and onion. Pour over the vinaigrette and fold in twice to integrate well all the flavours. Serve immediately. It is a tasty and healthy salad, ideal for a light lunch or dinner, enjoy!